Living on the road as we have for 6.5 years in Hamlet (our renovated 1957 canned-ham camper), gives us the time to focus on the people and interests that we too often neglected in our previous lives. Hobbies, extended visits with family and friends, nights in the back country, learning new skills and subjects, as well as giving back through volunteer work all fuel our adventures. Our goals evolved into what we now call our 4-4-4 plan. Each year we spend approximately 4 months on adventure travel, 4 months on seasonal work, and 4 months on volunteer work. This approach, along with some other money-saving techniques, helps us live large while living very small. Living frugally doesn’t mean dining on Ramen noodles, or parking in the in-law’s driveway, just because our income is closer to those summer break jobs. About 4 years prior to our decision to go full-time, we began aggressively paying down debt and saving. We set goals for each year and drastically cut out unnecessary spending. We sold almost everything we weren’t taking with us as we downsized to 72 sq. ft. All that money went into the travel fund. Traveling with an RV means that home is always where you park it, a luxury that results in reduced gas mileage. The good news is that there are plenty of legal places you can camp inexpensively or free, especially in the western region of the U.S. – though we’ve found plenty all across the country. The longest stint we’ve gone without staying in a fee campground is 10 months! Check it out. This traveling lifestyle has allowed us to visit friends, family, and former students all over the country. When we visit, we frequently do yard work, make dinner, pet/baby sit, or help with home improvement projects as a way to repay the hospitality. We have the time to pay it forward. We use The Dyrt (an awesome PNW-based camping app!) and Free Campsites website to find free or low-cost camping. If we are just passing through an area without camping options, we stay in rest stops, truck stops, approved Walmart parking lots, and quiet neighborhoods. Harvest Hosts offers free RV camping at over 700+ awesome wineries, farms, breweries, museums, and more – all for an annual membership fee of $79. Hamlet also serves as our basecamp when we want to wander into the wilderness – we park at a visitor center and backpack, bikepack, or sea kayak in remote locations. In 2016, we did an 18-day “Cascade Crossing” that was nearly free! We find volunteer opportunities which provide us a place to stay for a season and often much of our food. These experiences range from volunteering with the National Park System to volunteering on organic farms. We often took for granted the expenses of our previous life in a traditional house. Houses, even the most green-built, consume massive amounts of energy when compared to an RV. Using solar power can save hundreds of dollars by eliminating the need for an RV park with hook-ups. Because we keep our electrical needs simple, we can power our lives with a single 100-watt Renogy solar suitcase and 12V deep cycle marine battery. Our system powers LED lights, charges electronics, and runs the ceiling fan all night long. Solar curious? Do an energy audit to figure out what’s best for your energy needs/situation. We use propane for cooking and heating spending less than $125 per year. Instead of exchanging empty tanks, we refill them for half the price. While traveling, we use various gas apps to find the best deals on fuel. Both the Gas Buddy and Google Maps show gas prices along your route. Even if we aren’t on empty, we’ll fill up if we see a good price. When we’re parked somewhere for a week or a season, we use human-powered travel whenever we can. During our 4 months of volunteer or seasonal work, we often live on-site or within biking/walking distance. In July 2018, we lived and worked onsite at a campground / outdoor adventure center and only went through 1 tank of fuel for the entire month. Being outside and enjoying nature is one of the least expensive forms of entertainment. No need for fancy gear, just decent walking shoes and a water bottle…and maybe a bike. The National Park Annual Pass is just $80 for a family of four. Fourth graders (and their families) get into parks for free! If you are 62 or over, the pass is good for the rest of your life, and gets you half price on camping fees. Spending time in the visitor center, attending ranger programs, and participating in the Junior Ranger Program are a fun way to gain knowledge about the place and its inhabitants. There are currently over 400 National Park Service units, as well as over 100 Washington State Parks and 250 Oregon State Parks, all with fantastic entertainment and education. Some helpful apps we’ve incorporated into our travels are The Outbound Collective, TrailLink, AllTrails, and Road Side Attractions. Each provide helpful information about interesting (and often active and healthy) things to do in the area. We waste less food because we don’t have a lot of room to store perishables. When we had a residential-sized fridge, we frequently forgot about leftovers which got pushed to the back. But, with less space, you buy less and waste less! We cook tasty vegetarian meals. Eating lower on the food chain not only saves money, it’s the single most effective way to reduce carbon emissions. Whether it be on BLM land, in campgrounds, or backcountry sites, we love to cook outside. To celebrate Shari’s 50th birthday this year, Hutch made her a delicious German chocolate cake on the campfire. Challenge yourself and have fun with it! Note: We will be sharing recipes (and info about our favorite cookware) for some FUNtastic, low cost, campground meals in a future article. We don’t eat out much, but when we’re in cities, we splurge a little as we both love a good local diner. Going out for breakfast is often the least expensive meal, and if timed correctly, it can be brunch! No matter how big the rig, how ambitious the itinerary, everyone can reduce their travel expenses with a little prior planning and attention. We are constantly amazed by how little it takes to make our travels fun and memorable. Turns out the things we remember the most are the experiences without a price tag. Follow us on Facebook, Instagram or our website. We’d love to hear from you! In 2012, David Hutchison “Hutch” and Shari Galiardi left behind careers and a comfortable home in North Carolina to travel with the vintage camper trailer they lovingly restored, outfitted with solar, and named “Hamlet.” What they thought would be a year or two adventure around the continent transformed into a new lifestyle. 6.5 years later, with no end in sight, they share stories and insights from their mid-life adventure to large industry travel shows, intimate college campuses, open tiny houses in REI parking lots and a growing online audience. Traveling over 100,000 miles to 49 states, countless National Parks and other public lands, the couple pursues what it means to live the good life on their own terms and sustain it. 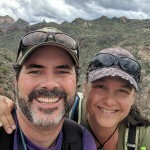 The writing and photography duo currently pen the popular “Full-Time Campers” column in The Dyrt’s online magazine and contribute to Renogy’s solar blog as well as other publications.